After all the excitement of the Chelsea Flower Show, I came home in need of some peace and calm. 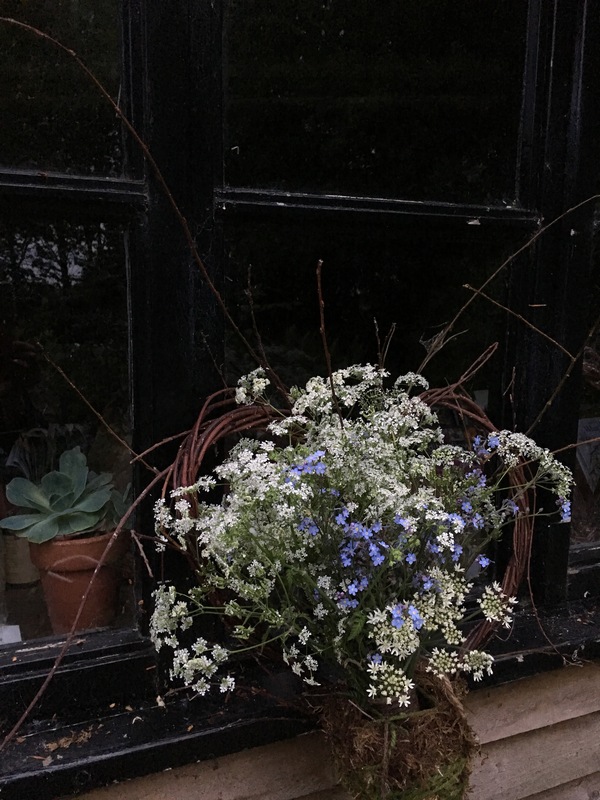 Nearly a quarter of my garden is smothered in cow parsley, and forget me nots pop up everywhere. So this week’s Monday Vase is a simple one -just frothy white and blue. I re-used my willow heart and mossy “nest” vase, which I wrote about Here. Look carefully and you’ll see little green hearts in amongst the forget me nots. I wish I knew the name of this pretty weed. It grows wild in my orchard. I treated myself to this lovely cream Vase from the Waitrose Easter collection. It’s in constant use! 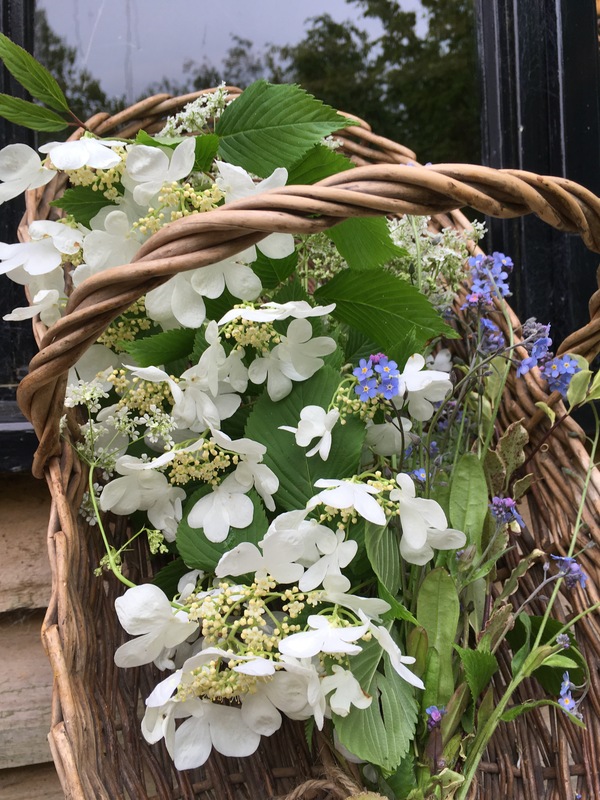 Also there’s a basket of white viburnum. This one is Viburnum Plicatum Mariesii which overhangs the horseshoe pond. From a distance, the viburnum looks like a tiered wedding cake. A delight for weeks on end during May. Thank you to Cathy from Rambling in the Garden for hosting this meme. 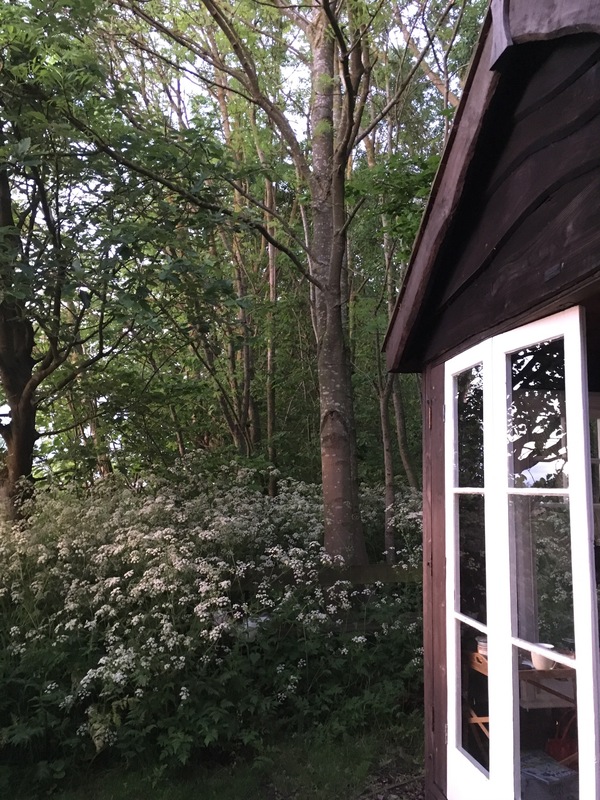 I’ll leave you with a picture of my summerhouse. And I wish you all a happy and peaceful bank holiday Monday. Lovely and wishing you a wonderful holiday as well! 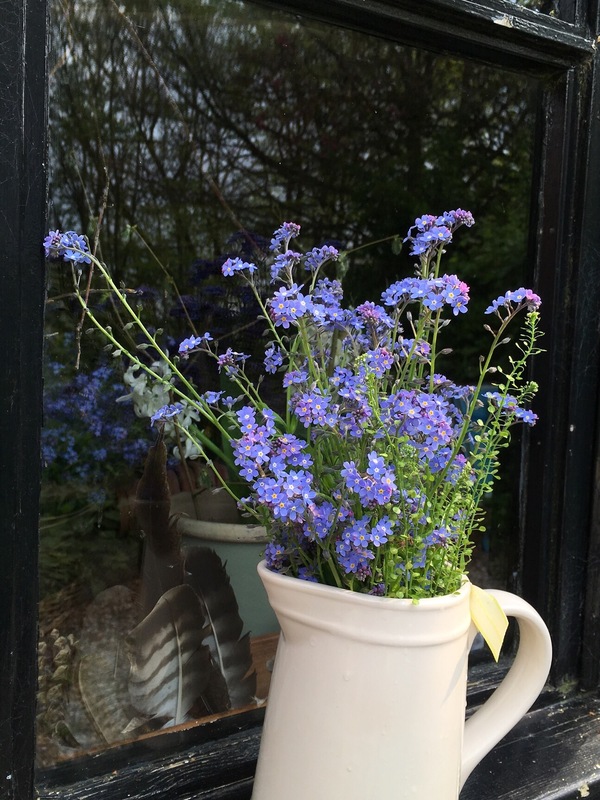 Love the froth, Karen – and isn’t the ‘weed’ shepherd’s purse? Your garden sounds lovely, even with a quarter if it given over to cow parskey! Thank you Cathy. Yes, that looks like the delicate weed with green hearts growing in my garden. Thanks for the identification- and for kind comments. Love the Viburnum, I used to have one but it was too hot and dry for it in my garden. I love forget-me-nots, they always remind me of my childhood. They grew wild and I could pick to my heart’s content. And the viburnum does look like a wedding cake! These are so pretty in blue and white. Cow parsley is always as winner as is forget-me-not. Beautiful frothy arrangements. The viburnum is stunning, I’m wondering where I could put one! Thank you for reading and getting in touch Alison. I can recommend Summer Snowflake as a slightly smaller shrub. I’m going to prune my viburnum after flowering. We can’t actually get to the pond any more. 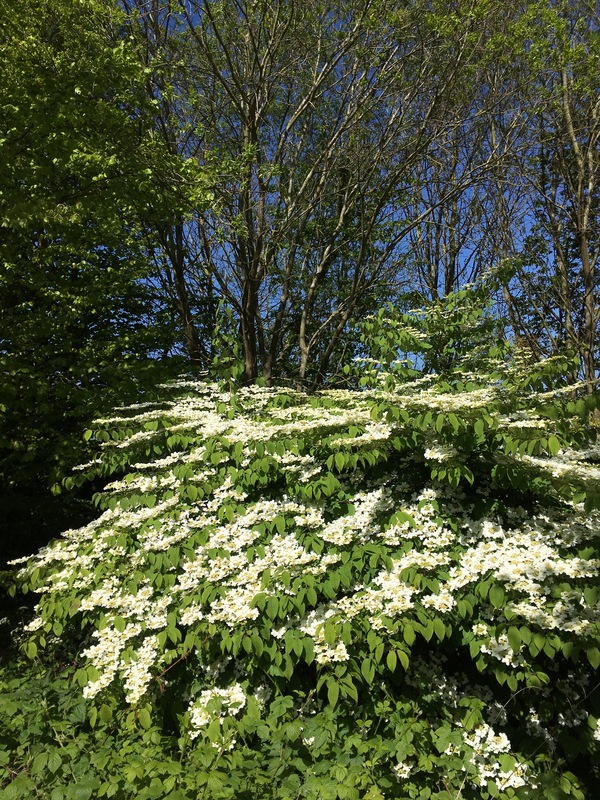 If you want a layered effect also try Cornus alternifolia argentea. I use that a lot in my garden design plans. Looks like a pagoda tree with lovely white flowers in summer and a nice shape all winter for snow and frost to settle on. All the best with your gardening. Charming sprays and bouquets of wildflowers. They would certainly bring some good cheer to a room. The beauty of wildflowers is one of the best parts of having nature flourishing around your home. It really is a calming vase Karen. Lovely. Hope you had a peaceful long weekend too.